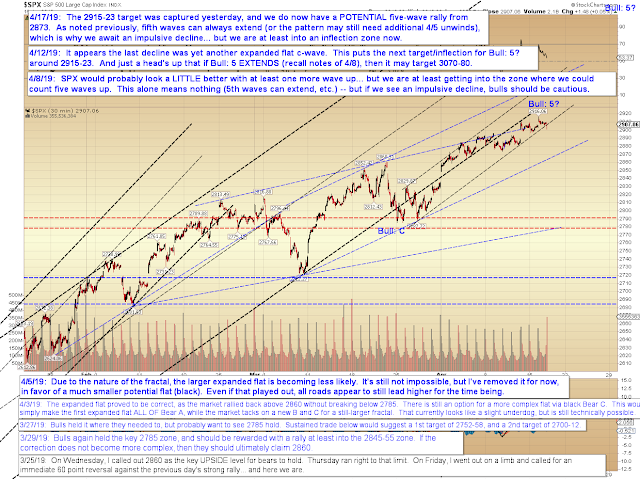 Yesterday saw the 2915-23 target captured, which puts the market into a potential inflection zone. We did see some reaction to that zone yesterday, in terms of a small sell-off -- but there's nothing conclusive yet that makes me want to start shorting with any conviction. As I've preached for many years, one can't short blindly into a bull wave; it is always best to await an impulsive decline. 1. Even if you correctly identify the location of the fifth wave, fifth waves can extend -- and when a fifth extends, it can run as far as -- or farther than(!) -- the entire rally leg has to that point. 2. The old expression that "bears take the elevator, bulls take the stairs" is true, and as a result, rally waves tend to be less clear about making their exact structure known. Sometimes what looks like a "fifth wave" is actually a new subdivision of, say, merely the third wave. The stair-step structure of rallies can be very deceiving -- at least until you see your first decent impulsive turn, which allows you to begin triangulating the count with more accuracy. 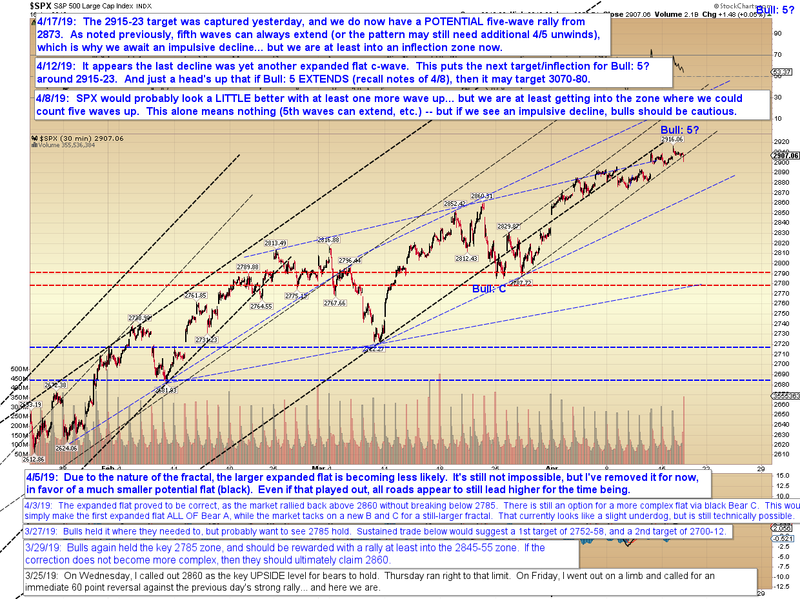 The above two reasons (and all the other reasons previously discussed; see: The Time and Place for Certain Analysis) are why I prefer to take a "ride the trend" approach during rally waves. That approach prevents us from spending every waking minute obsessing over "top calling," and from giving up on longs too early/getting into shorts too soon. So, until we see a clear impulsive decline (yesterday looked a bit like an impulse down in SPX, but as I warned on the forum, it was only an ABC in the e-mini S&P futures market), we have to presume bulls still have the ball. We are in the ballpark of an inflection point, but it remains to be seen if that will turn into anything more substantive in terms of stalling the rally. In conclusion, as I noted previously, the market is going to make its intermediate intentions known soon -- but as of yet, it hasn't given any new signals. Trade safe.